Large Girl Scout Cookie money bag is great for keeping your sale organized! This bag is the size of a typical bank bag, measuring about 11.5" x 6". Store your cash at booth sales, or use it to keep all your deposit receipts organized! 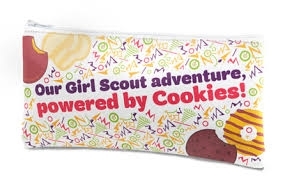 Bright design reads, "Our Girl Scout adventure, powered by Cookies!"